Photizo Vetcare is designed to treat domestic animals, large livestock and horses. It relieves pain, stimulates cells to repair and heal, reduces swelling and inflammation, and stimulates the immune system in acute traumatic conditions. Photizo Vetcare is especially effective in treating chronic pain and inflammatory conditions associated with arthritic conditions and overuse injuries in animals. Chronic ‘injuries’ or overuse inflammatory reactions occur when the tissue does not complete the healing cycle. Photizo Vetcare breaks this cycle and gives the tissue the opportunity to start the healing process if possible, or in chronic conditions to maintain pain-free periods. Treatment will stimulate optimum cell condition (bone, nerve, capsule, cartilage and muscle tissue) to maintain healthy tissue. This may help to prevent further degeneration of tissues like nerves, bone/joints and blood vessels. Treatment on the acupuncture points has excellent treatment outcomes. Skin conditions: wounds, lacerations, abscesses, saddle sores, skin allergies, eczema, etc. Corneal ulcers, viral-related conditions and sinusitis. How does Photizo Vetcare work? 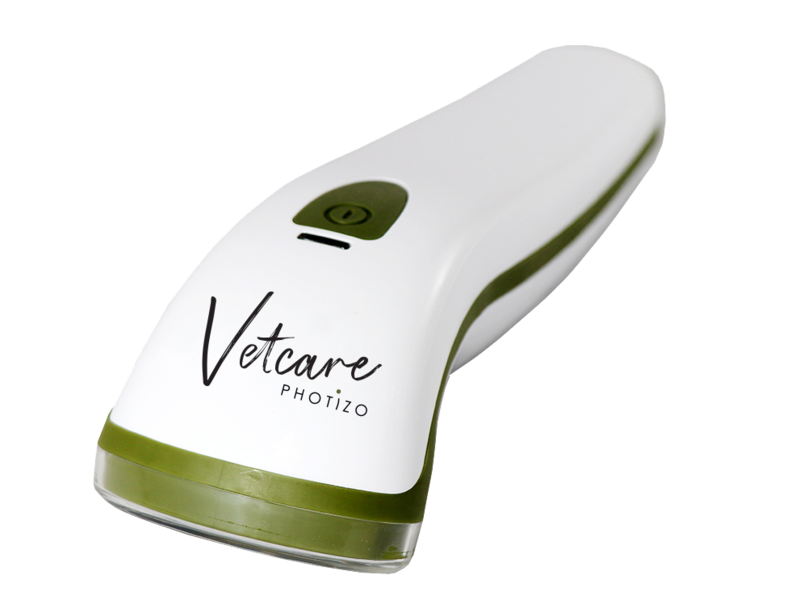 Photizo Vetcare’s LED light therapy harnesses the healing power of red and infrared light at specific wavelengths and frequencies for accelerated healing by activating the pain and relaxing ‘medication’ of the animal’s own body. LEDs, or light emitting diodes, are non-invasive, painless, produce a gentle and soothing warmth and do not require recovery time. Photizo Vetcare allows increased blood flow into the area being treated to ensure that any waste is quickly removed from the area. Simply place the Photizo Vetcare’s head (containing the LEDs) on the area of the animal to be treated, press the ON button and wait until the timed treatment ends, then move it to the next area requiring treatment. Repeat until you have finished treating all the desired areas. Get your Photizo Vetcare now! Copyright © Photizo® Light Therapy 2019.